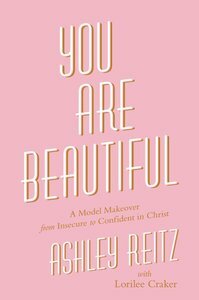 :YOU ARE BEAUTIFUL shows young women who feel like they are not thin/pretty/good enough how to find true confidence as they discover their identity in Christ. About "You Are Beautiful: A Model Makeover From Insecure to Confident in Christ"
After attending beauty school in Grand Rapids, MI, Ashley Reitz was offered a contract with Elite Model Management in Chicago, which quickly led to opportunities to work with other top agencies and clients as an international model. Her position as a "curve model" has given her a platform to promote a healthy body image to young women at conferences and through other venues. She has functioned as an ambassador for a popular movement called Healthy Is the New Skinny and has been on the board for Miss SW Florida USA. Ashley has appeared in the pages of major magazines such as Seventeen and in national ad campaigns for Avon, Saks Fifth Avenue, and David's Bridal. In May 2016 Ashley joined the cast of Mark Burnett's new reality dating show "Coupled" (Fox), quickly becoming a fan favorite along with her "match" B.T. Her greatest passion is speaking to young women about self-worth, identity, beauty, dating, purity, and the joy that only comes from knowing Christ. Lorilee Craker is the author or coauthor of nine books, including Date Night in a Minivan. A frequent speaker at MOPS groups and other mom events, Craker is also an entertainment writer for the Grand Rapids Press. A native of Canada, she lives in Grand Rapids, Michigan with her husband and her three children.